Bluehost and Hostmonster are two popular web hosting companies, and it can be tough to figure out which one might be right for you. This Bluehost vs Hostmonster hosting provider comparison will review both companies in terms of pricing, performance, usability, and other factors. While both web hosting services offer a variety of useful features, one might be a better fit for you or your business. Read on to find out who wins the Hostmonster vs Bluehost battle. Our first hosting provider, Bluehost, offers constant power backup through diesel generators and advertises that all user accounts are also backed up regularly. Bluehost asserts that its company monitors the servers at all time to prevent outages. Should a customer choose to leave the service due to a power outage, Bluehost offers a refund policy. With a server and data center that is monitored 24/7, Hostmonster offers its customers a 99.9% uptime guarantee. Even during a power outage, Hostmonster servers will continue to function due to its advanced synchronized power systems. Both companies offer reliable performance, but Hostomonster’s 99.9% uptime guarantee is hard to beat. So they win the Hostmonster vs Bluehost contest in terms of reliability. Both companies offer a variety of different plans and packages in varying price ranges. When it comes to shared web hosting plans, Bluehost offers three separate packages ranging from $2.95-$5.45 per month. Hostmonster, on the other hand, offers three shared web hosting plans ranging from $4.95 to $6.95 per month. The following table summarizes the Hostmonster vs Bluehost plans and prices. As you can see, Bluehost offers the same features for less money overall. 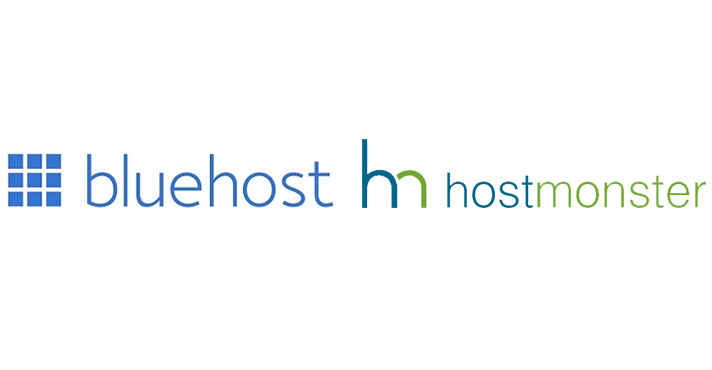 Because they are slightly more affordable, they win the Hostmonster vs Bluehost pricing comparison. Bluehost offers a variety of security tools to customers, including three anti-spam tools. The company offers secure shell (SSH) access for developers, meaning website administrators have a secure method of accessing configuration files. Bluehost also advertises that it regularly backs up user data for security purposes. Here is a list of all the features Bluehost offers. Hostmonster’s data center is monitored 24/7, and provides automatic backup, which can help customers avoid data loss. Hostmonster also offers Sitelock, which provides customers with spam monitoring and site verification. This feature helps both customers and visitors to customers’ domains feel safe about web page usage. Check their website to see the Hostmonster full hosting features list. Both companies offer cPanel for users. cPanel is an online interface that allows users to control and make developments to the web page through simple tools. cPanel is easy to use and understand, and gives users a great deal of control in managing aspects of the domain such as scripts, mail systems, and website backup. Along with cPanel, Bluehost also offers some other features in a customizable Bluehost user panel. Users can access both cPanel feature and Bluehost features with the same login, which makes using these features simple. Between the two companies, Bluehost offers more user-friendly features overall. Both companies offer 24/7 live customer support through chat, telephone, and email communication. For users who wish to find answers themselves, both Bluehost and Hostmonster also have a knowledge base, a user forum, and even video tutorials. In addition, Bluehost offers a helpdesk portal where users may view the status of the server and any known error. Both companies offer great customer support services, but Bluehost’s services are slightly more comprehensive. So, they win the Hostmonster vs Bluehost customer service comparison. Both Bluehost and Hostmonster offer a valuable overall user experience. Both companies offer reliable performance, data security, customer service, and user-friendly interfaces at an affordable price. However, Hostmonster generally offers more features than Bluehost. Between the two companies, Hostmonster comes out on top in most areas. Do you have experience with Bluehost, Hostwinds, or both? Share your thoughts with us today!